Before you start working on furnaces regularly, it might help to know how they work. A furnace uses gas, oil, or electricity to heat air. The warm air is circulated through ducts, pipes, or wires and then blown into the home through registers. 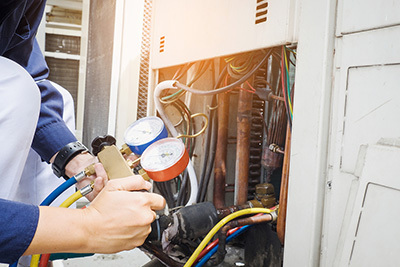 Prevent Breakdowns: Seasonal furnace checkups can ensure customers’ systems don’t breakdown unexpectedly on a freezing winter night requiring emergency service. Catch Deadly Leaks: During a gas furnace inspection, you could identify carbon monoxide leaks before they become dangerous. Did you know that 400 Americans die every year from unintentional carbon monoxide poisoning? 5 As an HVAC technician, you could not only keep your customers comfortable but also safe. Like other heating systems, furnaces should be inspected and serviced once a year. Fall is the best time to perform a seasonal furnace checkup to find and fix problems before they become bigger. However, preventative maintenance can be performed any time of the year though. What Are Some Furnace Maintenance Tips? Inspect the combustion chamber for cracks. Check for leaks in the connections between the furnace and main ducts and seal them. Test for carbon monoxide leaks. If any are found, suggest remedies to the homeowner. Ensure flame characteristics and fuel inputs are correct. For example, the flame in a gas furnace burner should be light blue in the center with a darker blue outer area. Yellow flames indicate the presence of carbon monoxide. Clean or change air filters. Clean and lubricate blower motor. Adjust blower control and supply-air temperature. Get rid of any dirt, soot, or corrosion on the furnace. Inspect the heat exchanger for leaks. Preventative furnace maintenance has many benefits for your customers. It keeps furnaces running properly and efficiently and potentially preventing dangerous situations like carbon monoxide leaks. Keeping your customers’ systems running smoothly can also save them from the cost of having to prematurely repair or replace components. What’s good for your customers is good for you, too, because well serviced customers are often loyal customers.